Chopin reached Paris via Germany in September 1831. It was supposed to be a short visit – a stopover on the way to London. The composer was barely 21 years old, but he had quite a lot of money at his disposal and plenty of opportunities to multiply what he had (he could earn as much as 500 francs per week offering private tutorials in music, which became very fashionable at the time). Chopin was perfectly groomed as well. The great emigration / What about Poland? George Sand appeared in Chopin’s life in 1836, at their mutual acquaintance’s salon. The composer spotted her – in a letter to his parents he recalled that her face seemed to him unpleasant and her personality – repellent. Ms Sand fell head over heels for Chopin practically from the start. She used to invite him over and also visited him, together with her other friends. Eventually, they became an item – a rather peculiar one at that. 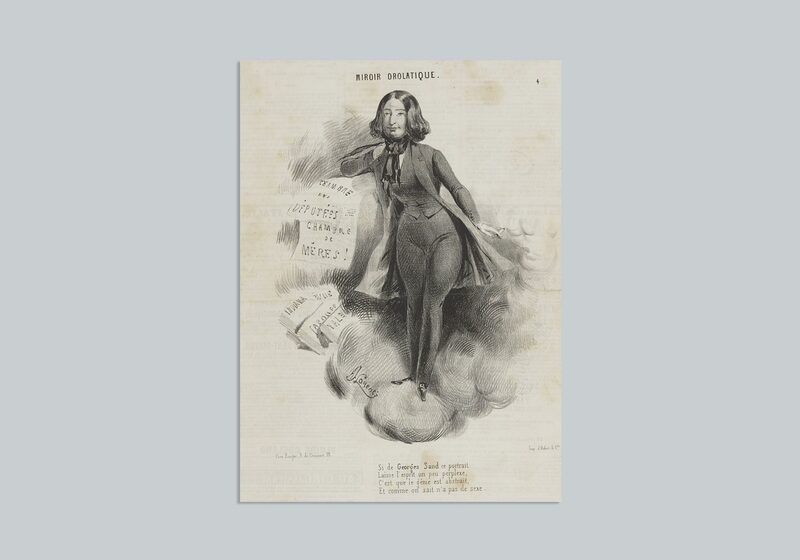 George Sand had already published about twenty novels; she regularly wore trousers and smoked cigars. They were together for over ten years – the years dotted with Chopin’s numerous health crises. Adam Mickiewicz / Poetry and nothing else? The great emigration / Lesser than the great? Chopin met Eugène Delacroix at George Sand’s place. The painter and the writer had been friends forever. Delacroix was considered a member of the Sand family and was invited for holidays to Nohant. The relationship between the artists has been noted in Delacroix’s diary. Polish composer is referred to as “kind and nice,” and as “dear little” Chopin. 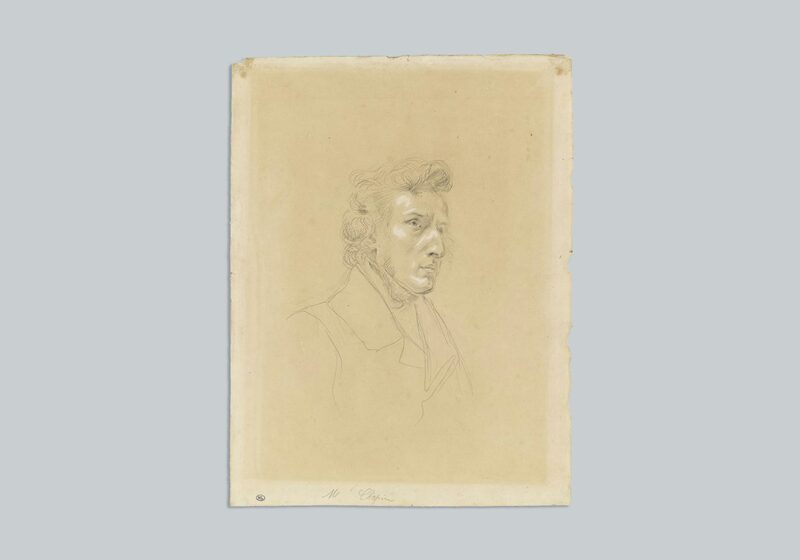 Friendship of the two artists resulted also in a number of very stirring portraits of the composer. If one could take a peek – through a window or a keyhole – into all the Parisian apartments and dens of Frédéric Chopin, the work of many generations of the composer’s biographers might turn out completely useless. 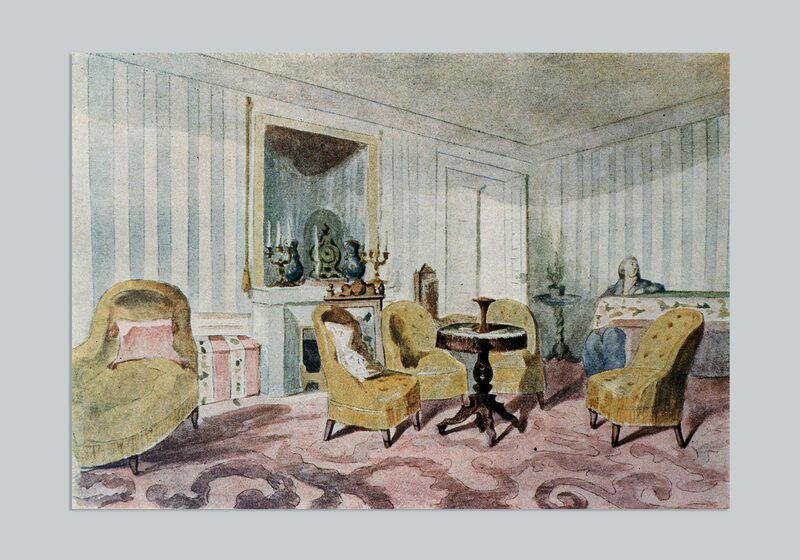 Chopin’s subsequent lodgings tell the tale of his life in the French capital. As a new arrival, Chopin began at a hotel room at Cité Bergère, today part of the IX Arrondissement. He stayed there for a maximum of two months – already on 18 November 1831 he bragged in a letter to a friend about his view “from Montmartre to the Pantheon, and along the river [onto] the entire beautiful world.” The entire beautiful world could be appreciated only from a height – first Parisian “beautifully furnished” place was located at 27 Boulevard Poissonière on the fifth floor, which made it considerably cheaper. The Parisian biography of Chopin – a virtuoso and bon vivant – does not fit the model story of a Polish post-November Uprising emigrant. Chopin, whose unique talent turned him into the citizen of the world and who socialized with a cosmopolitan artistic milieu, remained in regular contact with the emigre circles. He was an associated member of the (Historical) Literary Society and one of the co-founders of the Polish Technological Schools Society. He often gave concerts in aid of the Society and got engaged in the fundraising process. Chopin was a regular guests at Hôtel Lambert. Undoubtedly, there were times when Chopin played while people danced. The composer also had an exceptional talent to impersonate people – apparently he was excellent in mimicking not merely behaviour, but also the manner of speaking of others. The great emigration / Time to study! IS THE CORPSE SATIATED WITH LIFE? Chopin was dying for a long time – long enough to allow hundreds of people come visit. They all wanted to see the composer for the last time. He could barely breathe but as long as he could speak he would give instructions regarding his unfinished pieces („burn”) and musical accompaniment at the funeral („play Mozart’s Requiem”). He had apparently jotted down on a piece of paper the wish for his heart to be removed after his passing. It has been widely accepted and repeated that Chopin sent his heart to his homeland because – as Norwid put it in his obituary – he was a Pole at heart. Besides, Chopin – suffering from various psychological problems all his life – had a phobia of being buried alive. The Parisian chapter of Frédéric Chopin’s life begins in Vienna. He arrived there in the second half of November 1830, and managed to pay several visits and attend several concerts. The news about the outbreak of the November Uprising appalled the young composer. 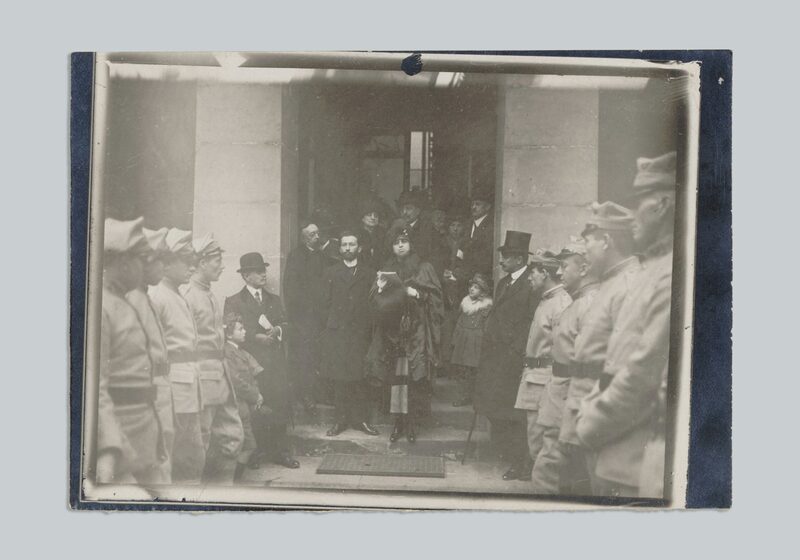 When all of his friends fought in the insurrection, Chopin – frail and sickly since childhood – struggled to give concerts, followed the news from his home country and dreaded the thought of his dear ones dying. He wrote, regretfully, to his school friend, Jan Matuszyński: “If I only could at least drum!” At around the same time, he began working on Étude in C-minor – ‘Revolutionary’ and Ballad in G-minor – his first composition in this typically Romantic genre. 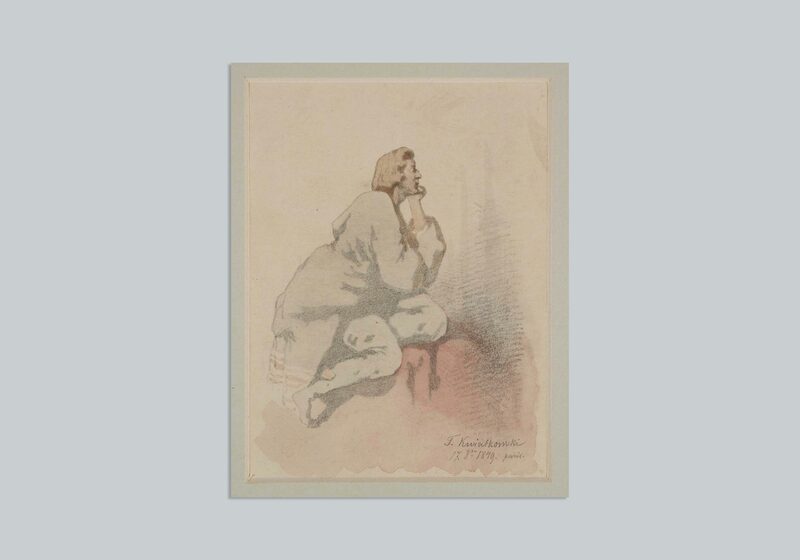 If Romanticism had been an infectious disease, Chopin would have caught it from Adam Mickiewicz back in Warsaw, transmitted by the book titled Ballady i Romanse (Ballads and Romances). Chopin reached Paris via Germany in September 1831. It was supposed to be a short visit – a stopover on the way to London. The composer was barely 21 years old, but he had quite a lot of money at his disposal and plenty of opportunities to multiply what he had (he could earn as much as 500 francs per week offering private tutorials in music, which became very fashionable at the time). Chopin was perfectly groomed as well. Did he promote himself? Yes, he did – according to the meaning of the French verb se lancer – he would throw himself in at the deep end, he would engage himself and gain more and more élan. “I am slowly promoting myself into the world,” as he wrote to a friend. Chopin’s first concert took place in the winter of 1832 at the Pleyel’s salon. 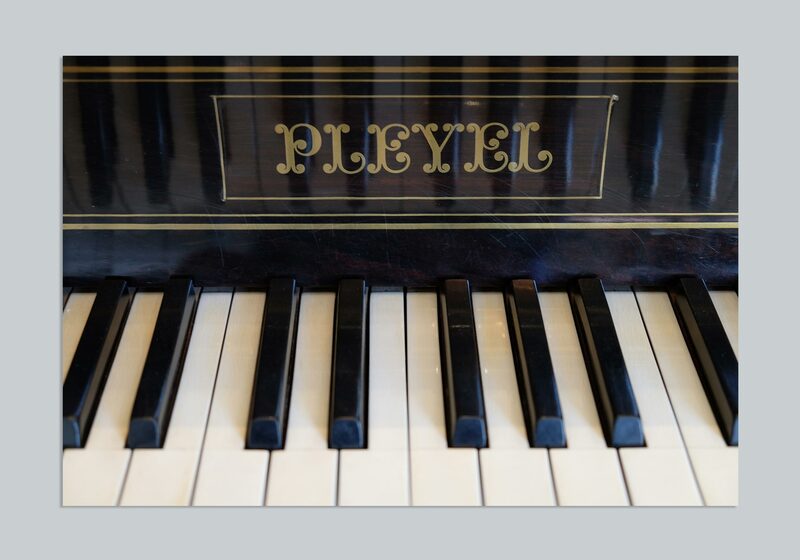 At the time, Pleyel was one of the most recognizable makes of grand pianos. He played, among others, Variations in B Flat Major Op. 2 on ‘La ci darem la mano.’ Here is how the composer Antoni Orłowski assessed his colleague’s performance: “He killed all the local piano players to death, Paris has gone crazy.” The “local piano players” – Hector Berlioz, Franz Liszt and Ferdinand Heller – soon befriended Chopin. He also made friends with the poets Heinrich Heine and Alfred de Vigny. Paradoxically, artistic, didactic and social success made Chopin compose much less; he was primarily busy preparing the scores of pieces he had composed prior to his departure from Warsaw for print. He was unable to work fast – from the initial draft of a piece to its final version sometimes several years passed. 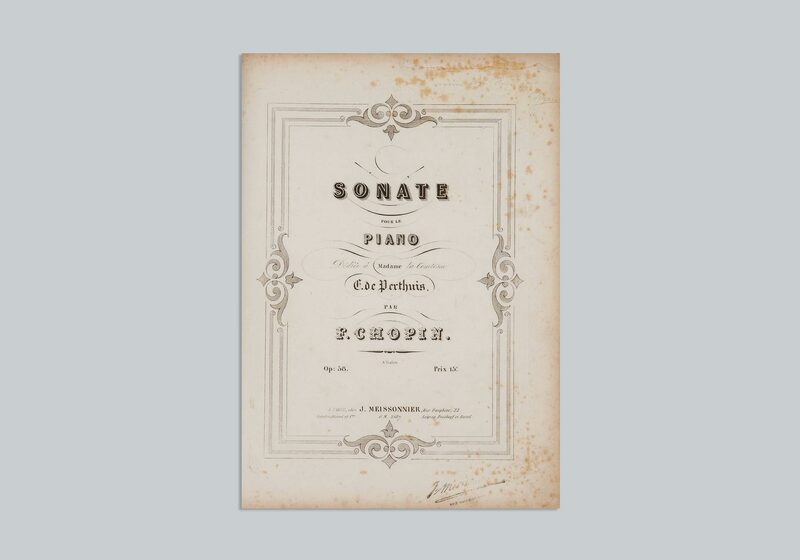 Chopin took his time developing and improving the pieces which were selected for print. Simultaneously, he had a reputation of an excellent improviser (especially – as Słowacki mentioned in a letter to his mother – after he had consumed some alcohol). In the mid-1830s the composer’s health gravely deteriorated. There were reports of his death reaching the home country. Chopin’s personal notes, especially the diary he had kept during his journey from Vienna to Paris, are testament to his obsession with the thought of death. At times, he perceived himself as a living dead. However, he did not die just yet – quite the opposite, a new era of his life was about to begin. There has always been a problem with Aurore Dudevant’s pen name. Juliusz Słowacki hailed her a “sort of Byron in skirt, Byron of prose that is” in a letter to his mother; he had sensed from the start that there was a woman hidden under a man’s name. Even in the 20th century, however, the national press, minor literary critics and reviewers used to analyse the literary output of Mr George Sand. That is how she – as George Sand – appeared in Chopin’s life in 1836, at their mutual acquaintance’s salon. The composer spotted her – in a letter to his parents he recalled that her face seemed to him unpleasant and her personality – repellent. At the time, Frédéric was involved in a romantic relationship with Maria Wodzińska whom he asked to marry and who accepted his marriage proposal… for a trial period. Maria’s parents’ were ready to accept the marriage plans, on condition that Chopin remains in good health. The couple never married in the end; among the fruits of their relationship is Waltz in A Minor, dedicated to Wodzińska. They were together for over ten years – the years dotted with Chopin’s numerous health crises. One such crisis forced them to cut short an unusually artistically fruitful stay in Valldemoza in February 1839. It was a time when the composer created his greatest musical pieces – the preludes, Ballades in F Major, A Minor, F Minor, Sonatas in B Minor, H Minor and G Minor. Chopin and Sand broke up in July 1847. Throughout his entire stay in Paris, Chopin was surrounded by friends and acquaintances. Following the breakup with Ms Sand, when his health significantly deteriorated, there was still a small but solid group of people who tended to his needs. The relationship between the artists has been noted in Delacroix’s diary. Polish composer is referred to as “kind and nice,” and as “dear little” Chopin. What is truly crucial, however, is the fact that after many discussions with his composer friend Delacroix came to the conclusion that the two seemingly different fields of art – in this case painting and music – not only can exert similar influence but can also be interpreted with the use of the same tools. The rules which govern both fields correspond with each other, despite the fact that they are realised by way of an entirely different medium – sound in the case of music and light and colour in the case of painting. It was precisely this mutual influence and correspondence that constituted the basis of Romantic understanding not merely of the arts, but of the surrounding reality as well. 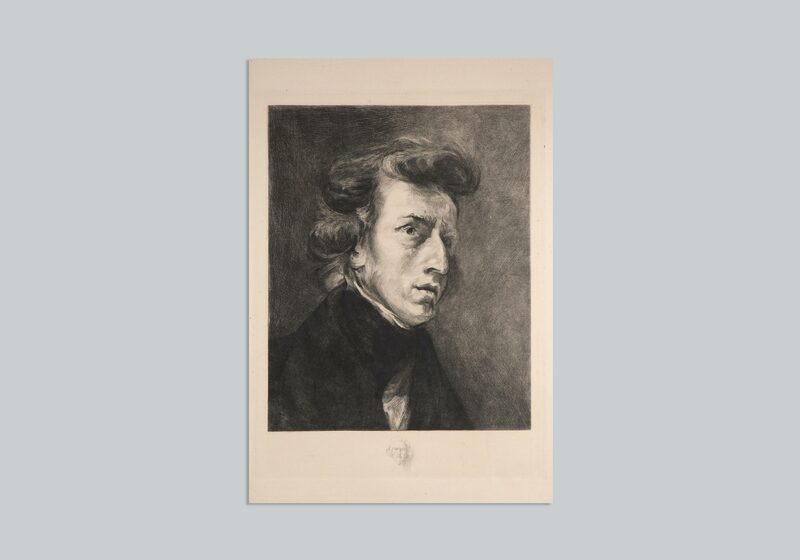 Friendship of the two artists resulted in a number of very stirring portraits of the composer. 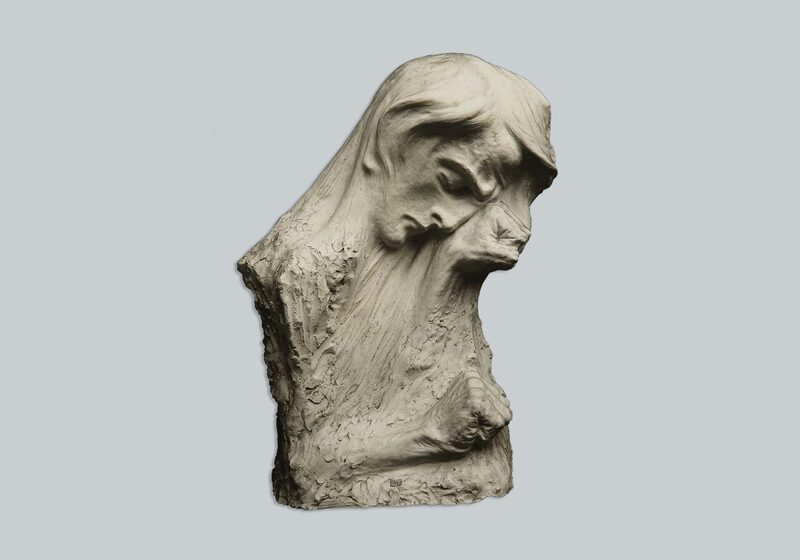 In the first one Chopin’s facial features, wasted away by his illness, were given to Dante. The painting was signed, once again, “cher Chopin”. Chopin as Dante and George Sand were depicted together on the cupola of the Senate Library in the Luxembourg Palace in Paris. Delacroix commenced work on the entire interior of the Palace in the early 1847; when the work was completed, Chopin and Sand did not live together anymore. 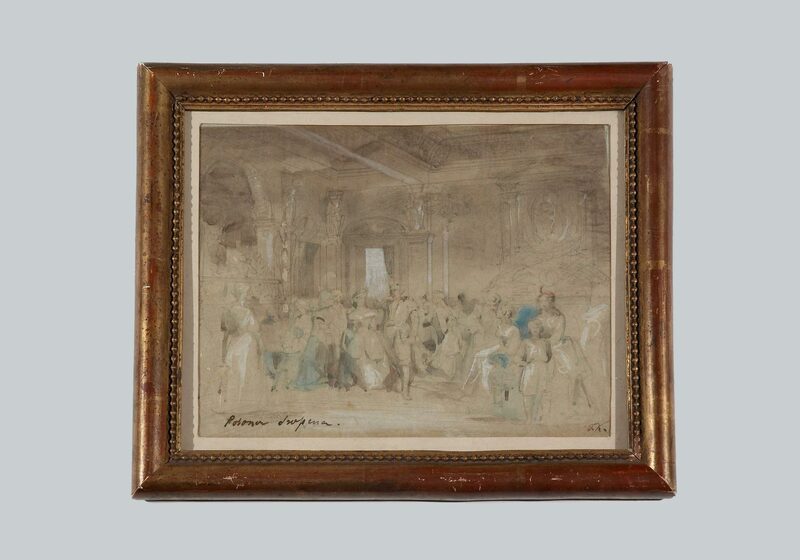 They did not manage to stay together on another group portrait by Delacroix either; the painting’s composition is known to us thanks to the only preserved sketch. The composer is sitting at a grand piano, accompanied by Ms Sand, seated at the back, with arms crossed at the front, her head turned towards her partner, as if the two were having a conversation. The finished painting had never been exhibited; after Delacroix’s death, its owner cut it in two and sold as two separate works of art. We do not know, until today, whether he did it for profit or whether he had been asked to do so by a third party. Today, Frédéric resides in the Musée du Louvre collection. If he chose to take a stroll to visit George Sand, laid to rest at the Glyptotek in Copenhagen, it would take him a minimum of 229 hours. As a new arrival, Chopin began at a hotel room at Cité Bergère, today part of the IX Arrondissement. He stayed there for a maximum of two months – already on 18 November 1831 he bragged in a letter to a friend about his view “from Montmartre to the Pantheon, and along the river [onto] the entire beautiful world.” The entire beautiful world could be appreciated only from a height – first Parisian “beautifully furnished” place was located at 27 Boulevard Poissonière on the fifth floor, which made it considerably cheaper. Chopin lived there for almost a year – the time in which he managed to promote his presence not only in various salons but also amongst the music critics. It soon transpired that the number of people interested in piano tutorials with Frédéric increased significantly and, as a result, the artist needed more space to be able to run tutorials in a comfortable setting. 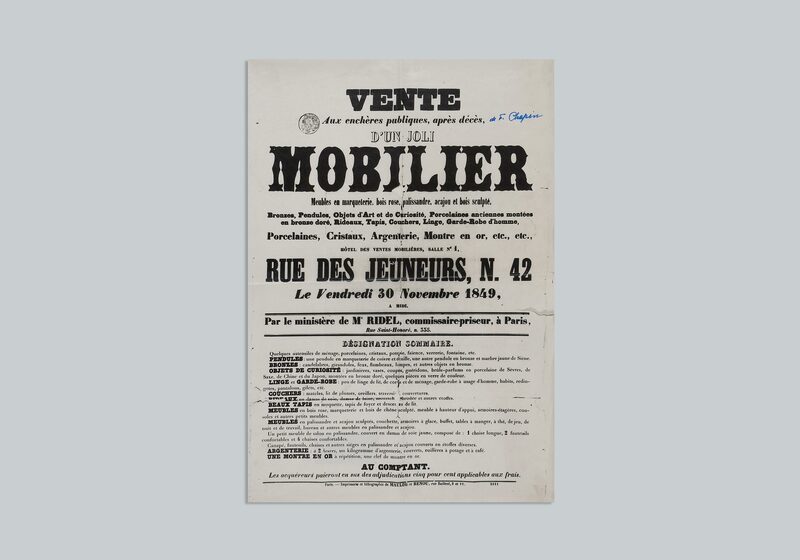 He moved across the street to the apartment at 4 Cité Bergère nr 4. The next apartment, still larger and more elegant, was at 5 Chaussée d’Antin. Chopin shared it with his acquaintance from Warsaw, Aleksander Hofman. In April 1834, the musician got a new flatmate – Jan Matuszyński, who also tended to Frédéric’s health problems. It was here that the composer ran a salon and entertained his friends. It was from here that he set off for Majorca. He returned from there straight to George Sand’s property in Nohant near Paris, where he was to spend each summer. He resigned from the previous apartment already during his trip, and began to look for a new one remotely, with the help of Wojciech Grzymała and Julian Fontana. His requirements were by no means inordinate: “My dearest! Take a small flat, and if it’s already too late, take a large one; whatever, just so that we have a place to live,” he wrote. When confronted with specific offers, he enquired: “Once again – are you sure it is in fair condition, it doesn’t stink, it isn’t filthy; the building’s not too crowded with neighbours into whom one would bump each time upon leaving the flat? Are you sure there is no cornet à pistons there, or something of the kind?” Cornet à pistons is a 19th century name for a French horn. Whoever would like to share a tenement house with a brass band? That is how Chopin moved in at 7 rue Tronchet, near the Madeleine Church. It took a quarter of an hour stroll to reach the house at 16 Rue Pigalle where Ms Sand resided with her children. Eventually the couple decided to move in together. „Together” when referred to non-legalised unions who cared to keep up appearances meant residing in the same street or in the same building. The lovers moved in to two adjacent apartments at Square d’Orléans. The composer occupied a two-bedroom flat on the mezzanine with a view overlooking the square, the writer settled in a larger apartment four numbers away, on the first floor. After the couple split up, Chopin moved in to 74 rue de Chaillot, in the vicinity of the Avenue de Champs Elysees. In Czarne kwiaty (Black Flowers), Norwid noted that Chopin’s health was so frail at the time that he had not enough energy to climb up to his flat and had to be carried. It was here that a draft for Mazurka in F Minor was written – in all likelihood the last piece composed by Chopin. 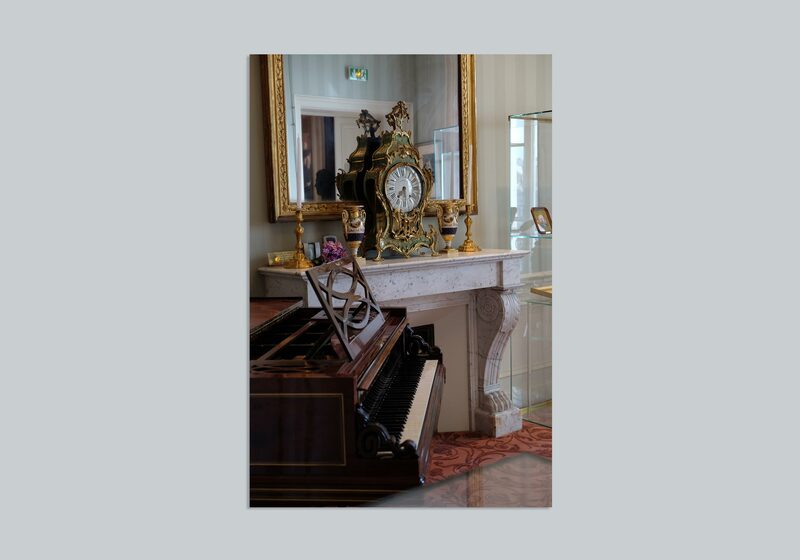 It is from here that Chopin „moved” to 12 place Vendôme where he planned to spend the winter of 1849. On 30 November, the furnishings from the apartment were put up for an auction. The Parisian biography of Chopin – a virtuoso and bon vivant – does not fit the model story of a Polish post-November Uprising emigrant. 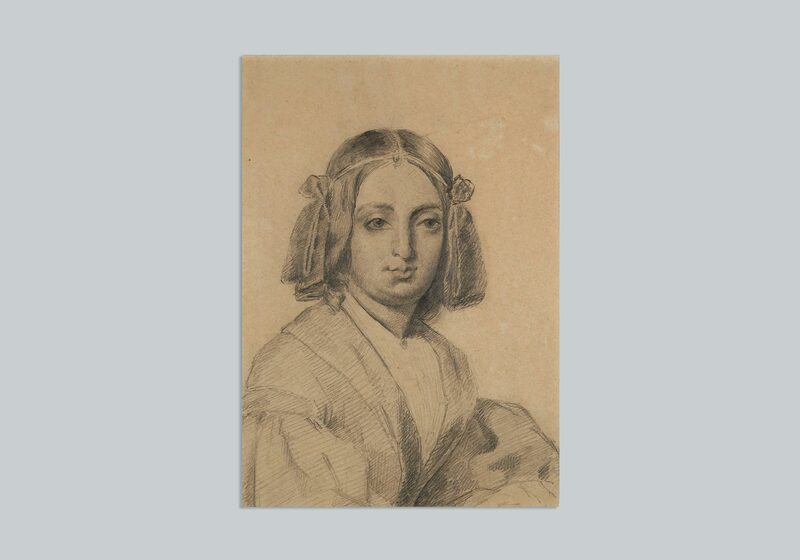 While getting ready to return from his travels across England and Scotland with Jane Stirling – aimed to boost his morale, following the breakup with George Sand, but in fact utterly exhausting in his frail condition – the composer wrote to Grzymała: „My life! […] Tell them to buy a bouquet of violets on Friday, so that the scent fills the entire living room.” At around the same time Juliusz Słowacki visited a Parisian room rented by an emigre poet Seweryn Goszczyński and he could not even sit down – the poet could not afford a chair, and his shirts were patched up with the use of an old sheet. Chopin was a regular guests at Hôtel Lambert. Duchess Anna Czartoryska, for whom he dedicated Rondo a la Krakowiak in F Major Op. 14, engaged him in charitable undertakings, although most often Chopin would simply attend „musical evenings”. The Czartoryski family also visited the composer. In the spring of 1846, Ms Sand wrote in a letter to her son: „Yesterday, Chopin invited us over for music, flowers and spree. 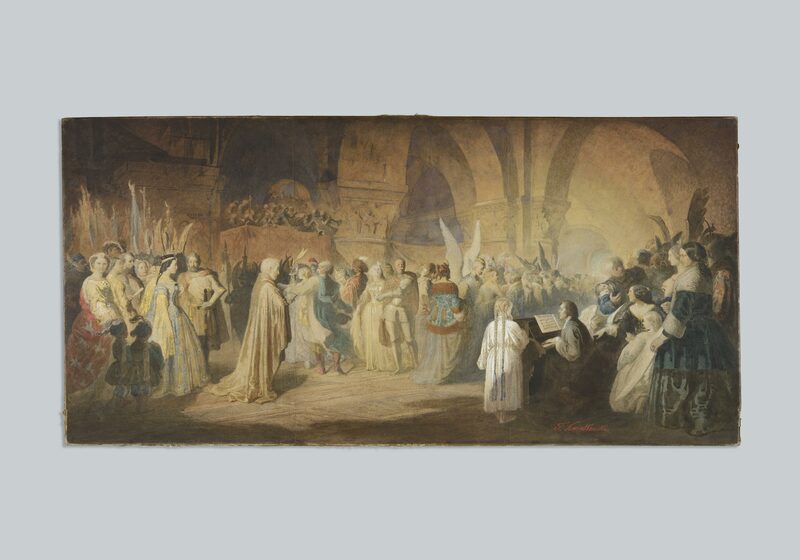 Duke and Duchess Czartoryscy were there too, and Duchess Sapieżyna, and Delacroix.” Undoubtedly, there were times when Chopin played while people danced (and „he could go on forever,” as some recalled). The composer also had an exceptional talent to impersonate people – apparently he was excellent in mimicking not merely behaviour, but also the manner of speaking of others. 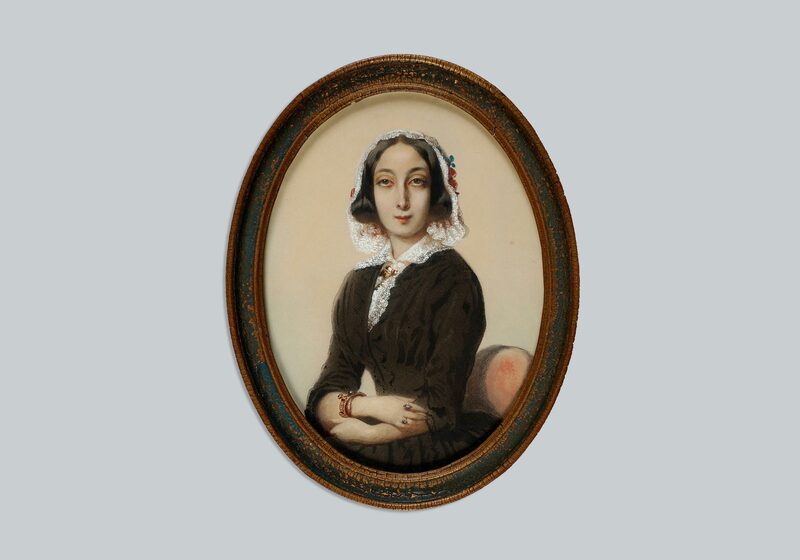 Marcelina Czartoryska, wife of a nephew of Duke Adam Jerzy, was Chopin’s student and friend. She looked after him during his last days, until 17 October 1849. Chopin was dying for a long time – long enough to allow hundreds of people come visit. They all wanted to see the composer for the last time and, as Pauline Viardot, a singer, commented: „[considered it] their last duty to faint in his room.” The door to the apartment at Place Vendôme was ultimately closed by the composer’s sister, Ludwika Jędrzejewicz. Delfina Potocka, a student and a friend, nowadays known mostly for her love letters to Zygmunt Krasicki, also accompanied Frédéric till the very end. Apparently, she sang to him at his bedside – upon the dying man’s request. Solange, George Sand’s daughter, provided an accompaniment on the piano which had been moved into the bedroom. 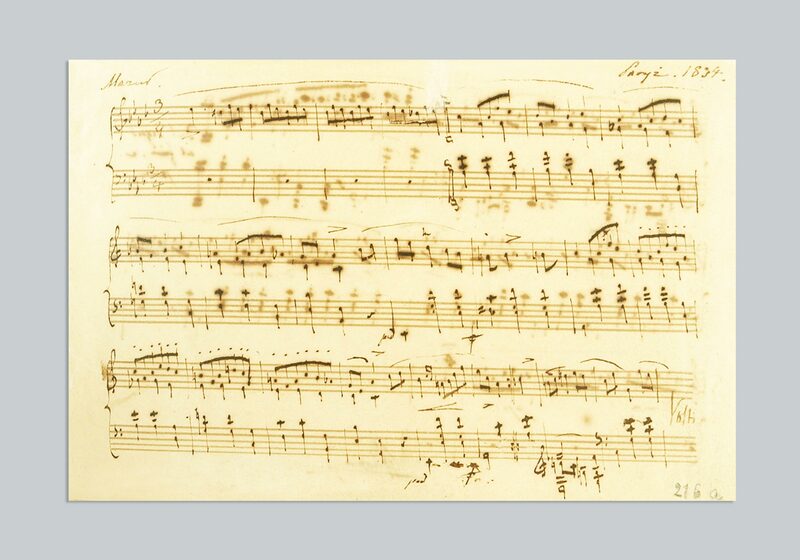 Chopin could barely breathe but as long as he could speak he would give instructions regarding his unfinished pieces („burn”) and musical accompaniment at the funeral („play Mozart’s Requiem”). He had apparently jotted down on a piece of paper the wish for his heart to be removed after his passing. It has been widely accepted and repeated that Chopin sent his heart to his homeland because – as Norwid put it in his obituary – he was a Pole at heart. Besides, Chopin – suffering from various psychological problems all his life – had a phobia of being buried alive. 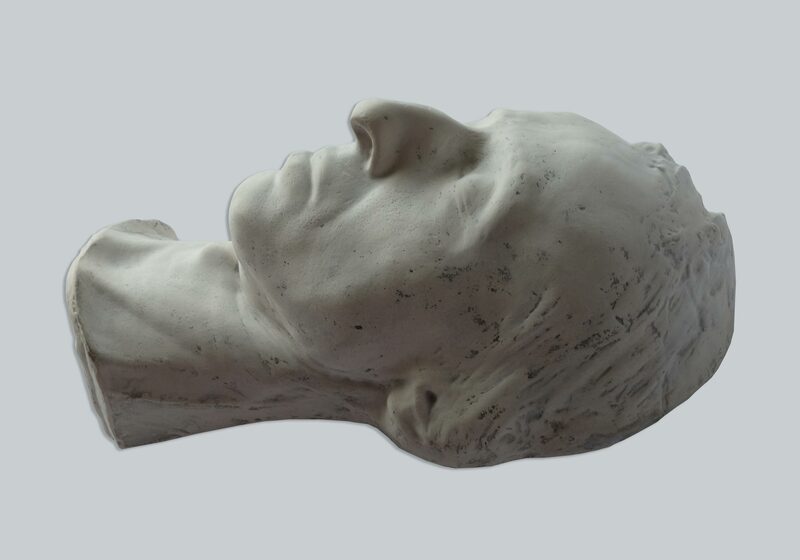 August Clésinger, the sculptor and husband of Solange, made Chopin’s posthumous mask twice. The first one, documenting the composer’s emaciation, became the family property. The other one, smoothed and remodelled, became the official image of the deceased virtuoso. The funeral was held at the Madeleine Church. Chopin’s heart, put away in a jar and hidden amongst the folds of Ludwika Jędrzejewicz’s dress, was on its way to Warsaw. It has been placed at the St. Cross Church on Krakowskie Przedmieście Street, embedded into one of the pillars. Chopin gave a later version of the piece to Wilhelm Kolberg who was a great expert of folk music. He was also the brother of Oskar Kolberg, one of Poland’s most prominent ethnographers. 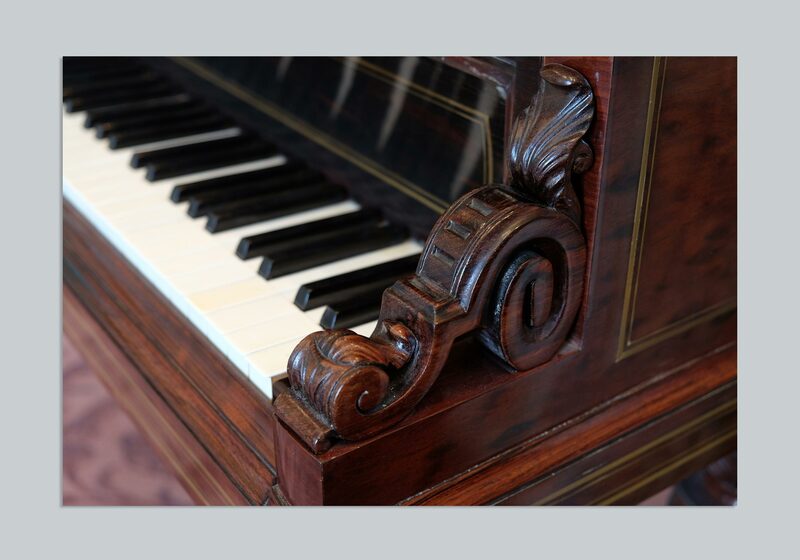 Camille Pleyel took over the famous piano manufacturing firm after his father’s death and had great business sense. In Paris he opened a concert hall where he would invite the best pianists of his time. Chopin did not only “write to Pleyel for a better piano”, he was also friends with him. 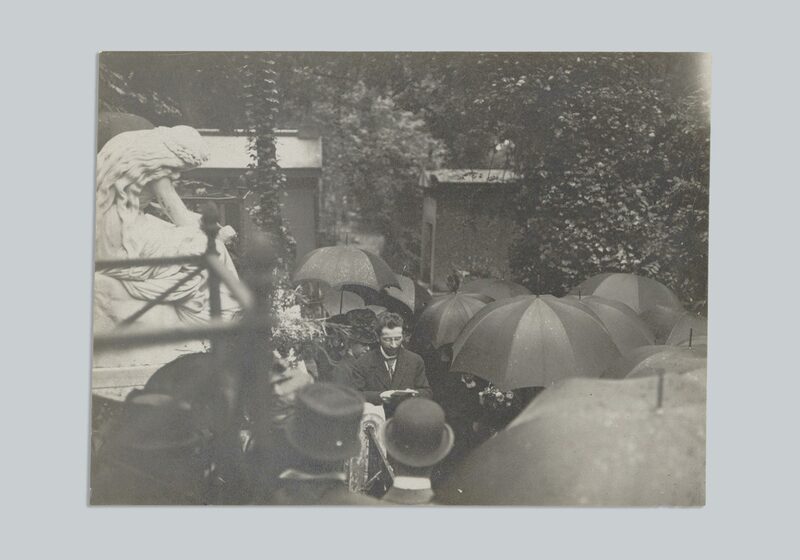 It was thanks to Camille Pleyel’s initiative that the committee for building a monument on Frédéric Chopin’s grave was created. Chopin dressed with a classic elegance when he lived in Paris. However, he disliked the dandy novelties that Słowacki fancied very much. While in Nohant during the winter of 1844, Chopin favoured comfort. In a letter to Mrs Sand he confessed to wearing “three layers of flannel under his trousers”. 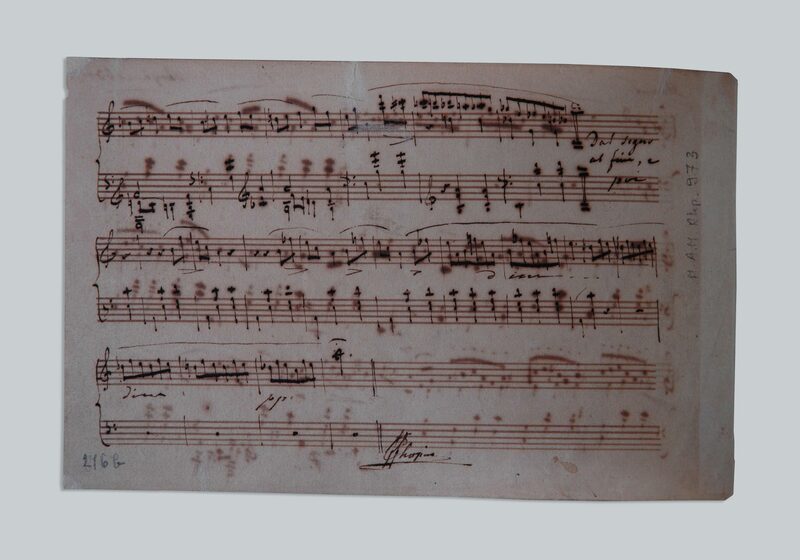 Chopin dedicated his sonata to ZofIa Rosengardt (inscription visible in upper right corner), who knew him from Warsaw. She came to Paris specifically to receive lessons from the master but had to wait almost half a year. Even though she admired Chopin and secretly hoped to marry him, in the end she became the wife of poet Józef Bohdan Zaleski. Teofil Kwiatkowski was the most important painter of the Great Emigration and he often portrayed other members of this circle. Chopin and his music became an important subject of his art. George Sand was known as scandalous but the reason was probably her lifestyle rather than eccentric behaviour. In the 19th century a woman who was “sort of married”, raised two children and supported herself was not a common sight. But the novelist’s clothing style might have been shocking — she was known to combine male and female clothes. That was probably seen as offensive by certain social circles. She was also often criticized for smoking cigars publicly though, to be fair, it should be noted that they were “ladies” cigars. It is certain nonetheless that George Sand used to wear dresses. On most of her surviving photographs she is seen dressed in very feminine clothes, sometimes sporting a flower in her hair. 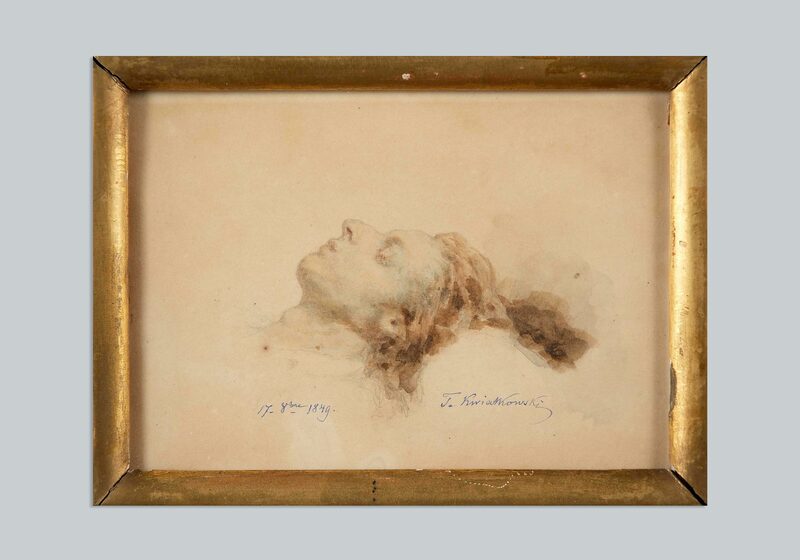 The original of the portrait of Chopin sketched by his friend and lover did not survive. Today we only have its copies and photographies. 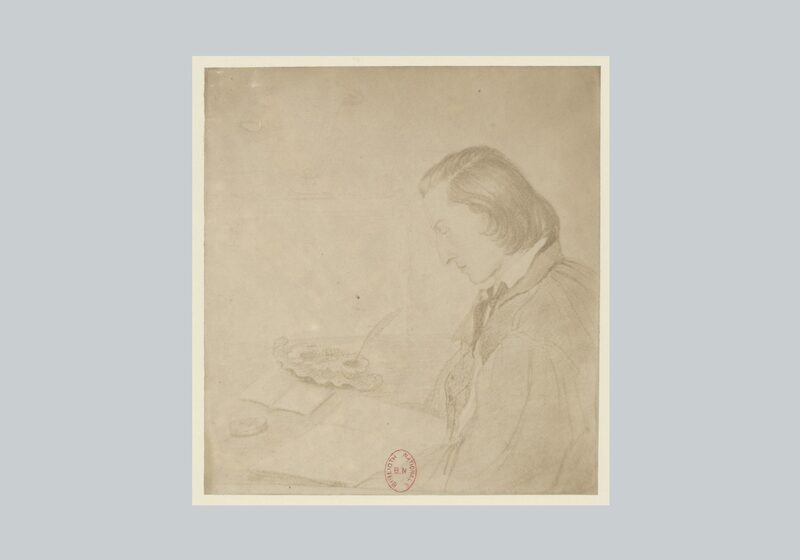 Chopin in the eyes of George Sand sits focussed over a sheet of paper, with ink-stand and quill in reach. Miss Sand must have captured a moment of musical composition. The history of Chopin’s and Sand’s lost double portrait is unclear until today. 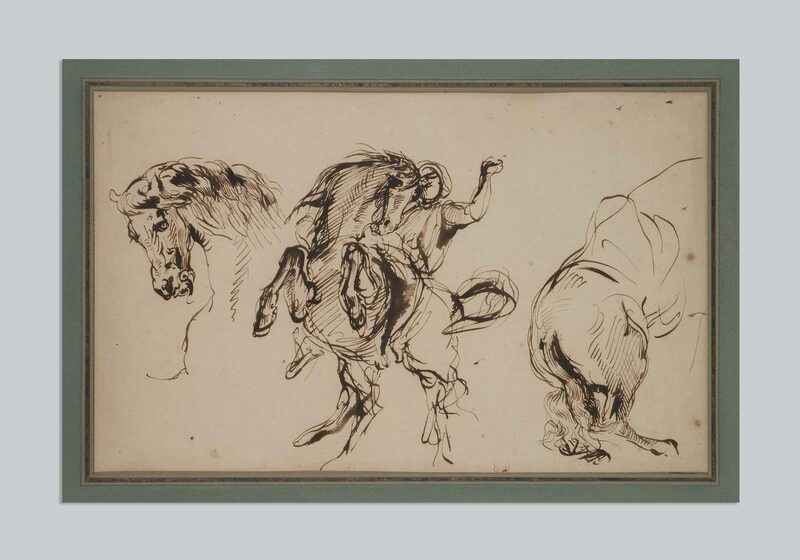 Delacroix’s sketches of both artists are very detailed, therefore his became one of the composer’s most famous portraits. Chopin’s portrait has been reproduced numerous times. On this aqua forte by Omer Bouchery according to Delacroix, the painter’s full face can bee seen on the bottom part of the mat, right below the pianist’s necktie. Eugène Delacroix is viewed as one of the most important French Romantic artists. He distinguished himself from his predecessors by his dynamic compositions (like on the presented sketch), bold usage of color and the contemporary events that were subjects of his art. 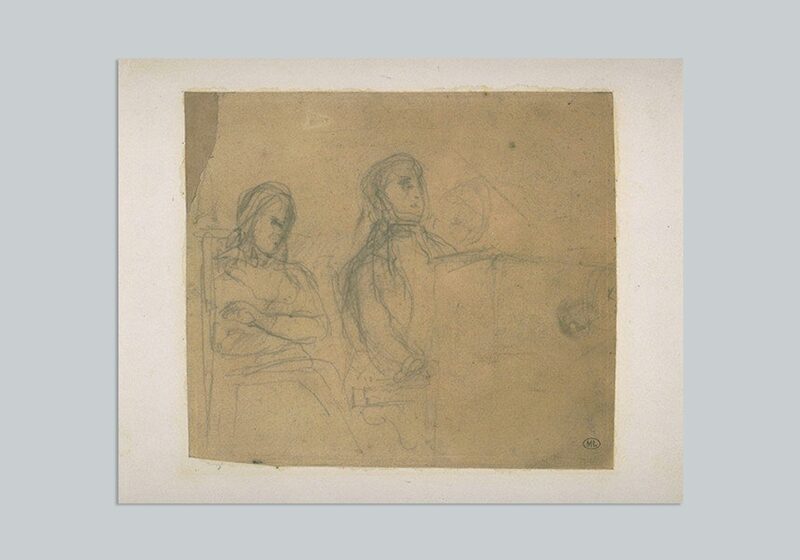 On the surviving sketch for Chopin’s and George Sand’s double portrait the composer is playing the piano, his head slightly raised while Sand sits besides him, making a characteristic gesture with her left hand which can be interpreted as a reaction to the music. 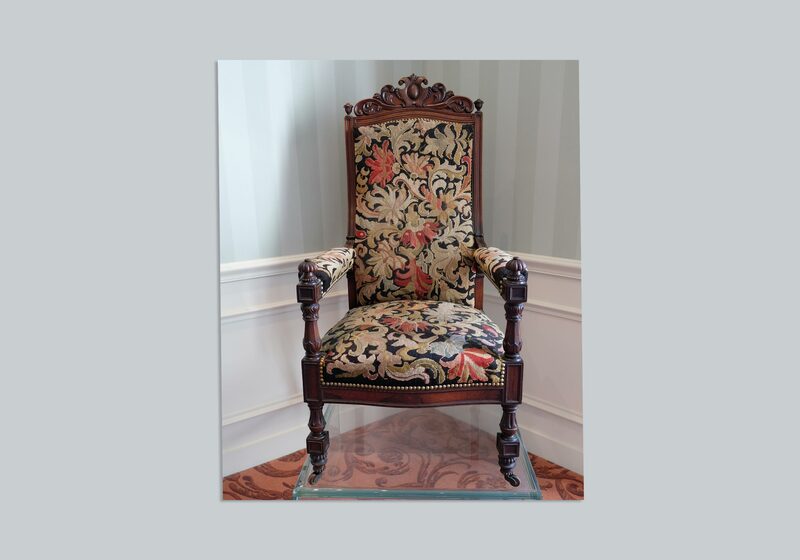 This chair, covered with patterned fabric, was one of the pieces of furniture that Chopin had in his last apartment by the Place Vendôme. Chopin moved to the Place Vendôme for health reasons — the big five-room apartment was supposed to provide him with much needed daylight. Chopin moved into the apartment in late September 1849, and in October rains and cold weather began. The big apartment had a bad effect on the composer’s health and he died in these rooms. The so-called Chopin’s Salon is situated on the first floor of the building on Quai d’Orléans 6. There, visitors can see elements of interior design from the times of Frédéric Chopin, including the composer’s original chair. 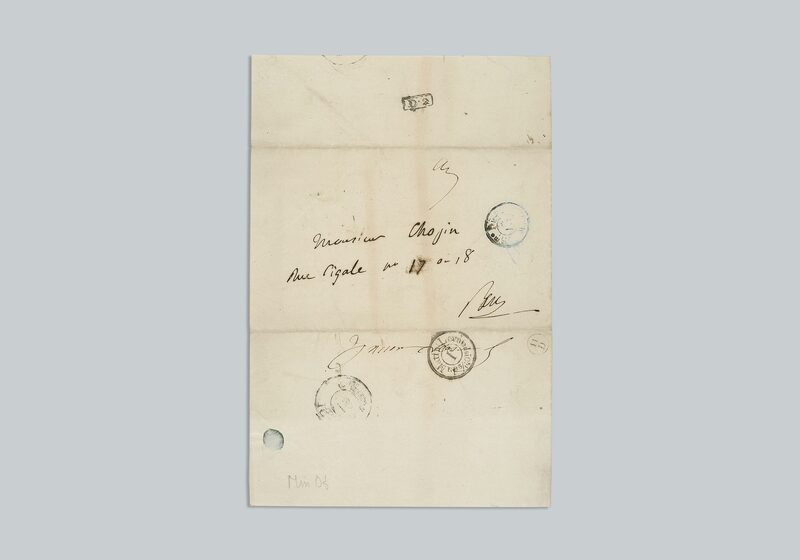 The envelopes in which Chopin received his correspondence help recreate his subsequent addresses. 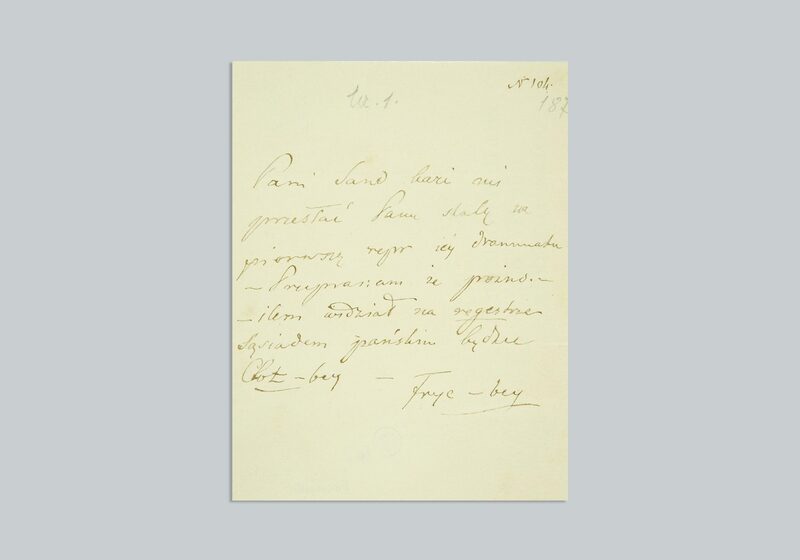 The composer never lived by the Place Pigalle – this letter, though addressed to him was therefore delivered to George Sand. 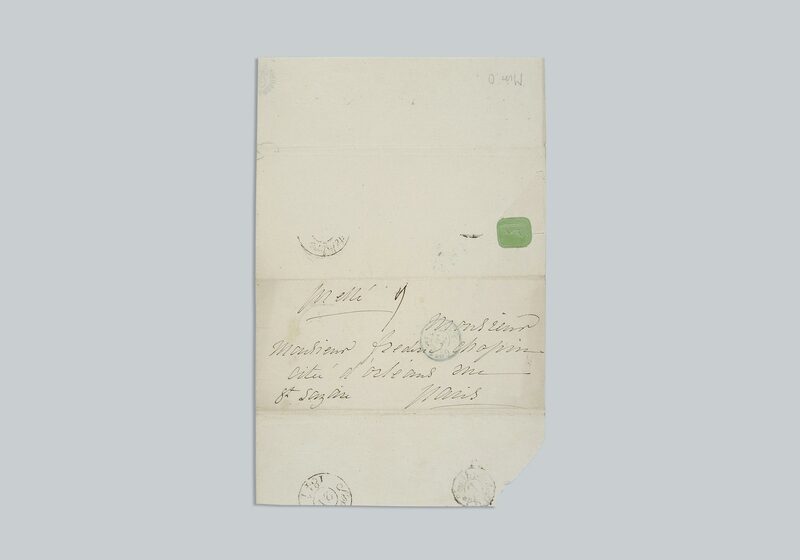 We can see that the sender hesitated and finally decided to inscribe the numbers 17 or [ou] 18. A sale of the possessions of a recently died famous artist was common practice in the 19th century. 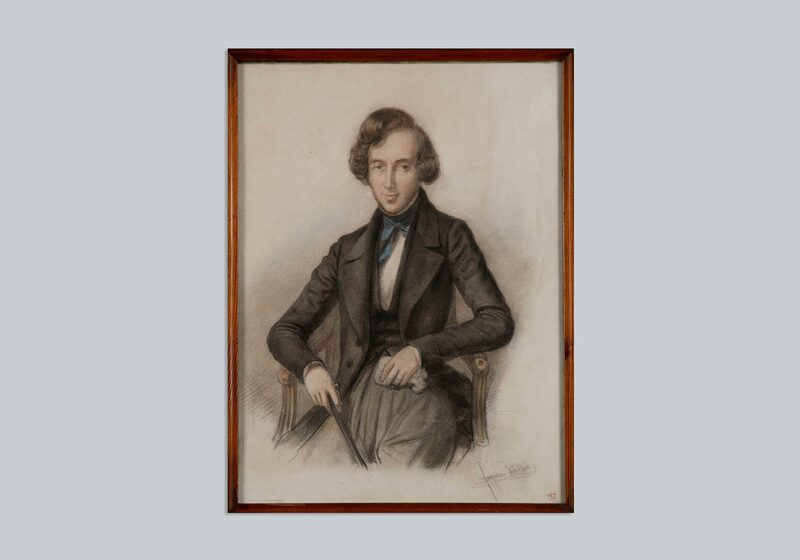 After Chopin’s passing not only his furniture and valuables were sold, but also his clothes. 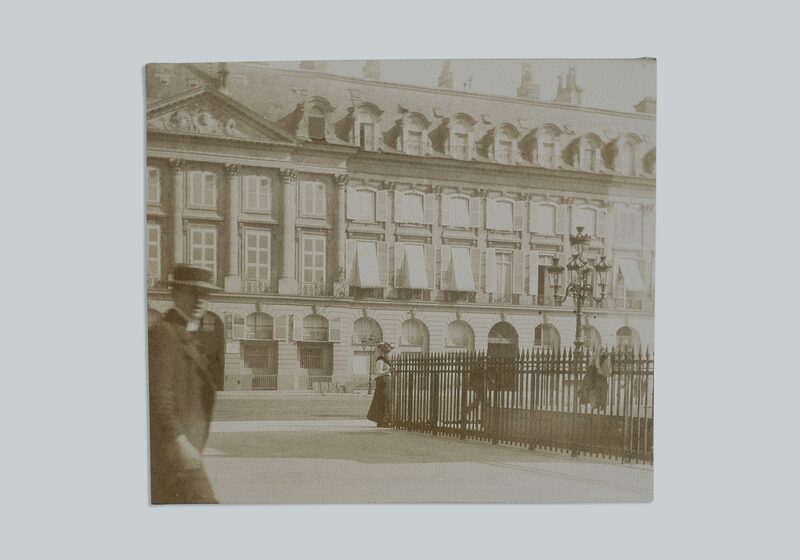 Eduard Ganche, standing by the entrance of the house by the Square d’Orléans. Ganche was an admirer of Chopin and a collector of his memorabilia. It is thanks to his efforts that memorial plaques were placed on some of the Parisian buildings that the composer lived in. In 1833 Frédéric Chopin became a member of the Literary Society (Polish: Towarzystwo Literackie). 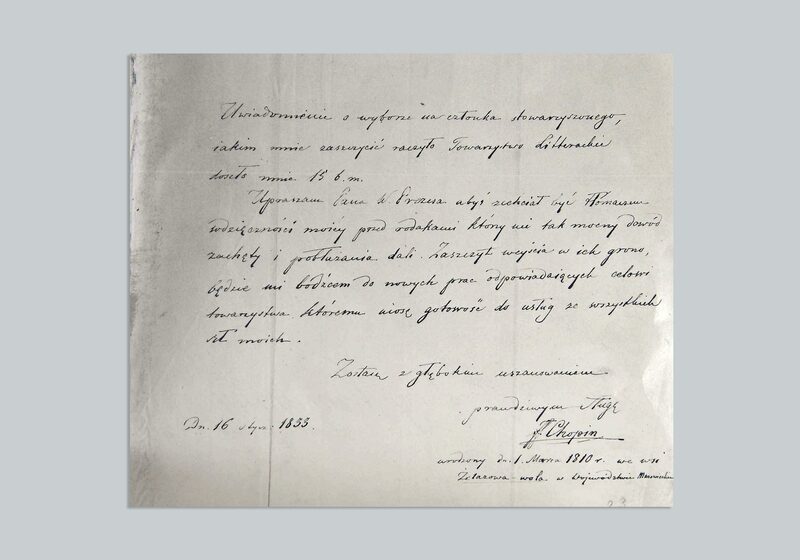 In a letter to Adam Czartoryski he expressed his gratitude for his acceptance into the Society and promised to work for it with “all his might”. Ludwik Plater, a close associate of Adam Czartoryski and active member in the circles of the Hôtel Lambert. In 1818 he was one of the founders of the School of Forestry (Polish: Szczególna Szkoła Leśnictwa) in Marymont by Warsaw. One of Kwiatkowski’s better known works, it includes the images of many important members of the emigration society. 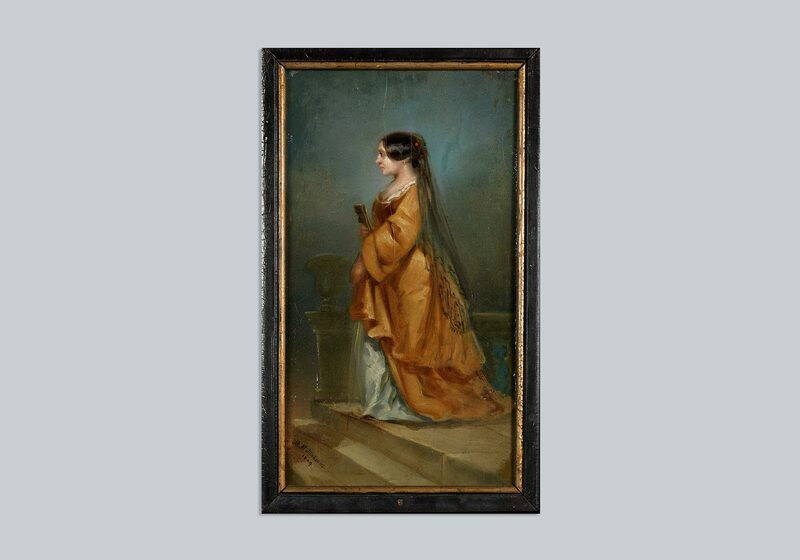 Apart from Chopin, Mickiewicz and Adam Czartoryski, the artist also portrayed Marcelina Czartoryska and George Sand. Teofil Kwiatkowski did many sketches for the “Ball…” Over a dozen of them is dedicated to the composer. Chopin’s death was a source of inspiration for many other artists. Often they depicted the moment of his passing in an idealized and pompous way. 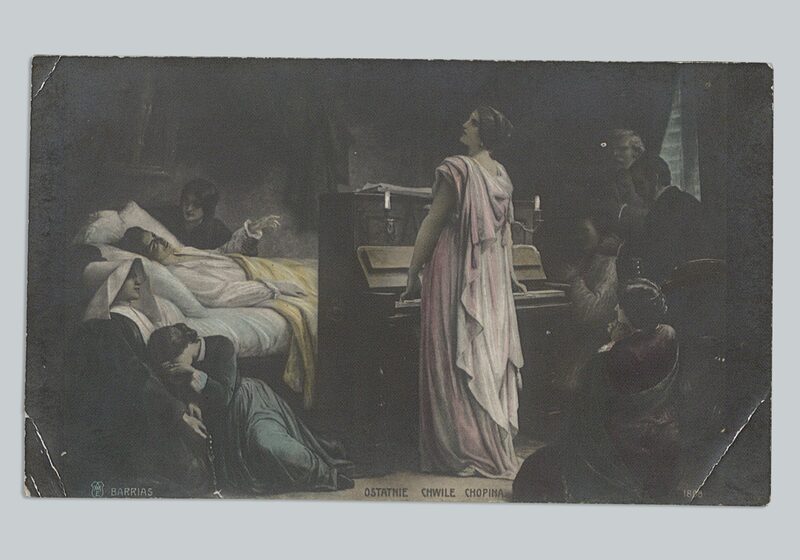 The depictions of Chopin’s last moments were often reproduced and used as souvenirs of commemorations of the composer’s following death anniversaries. 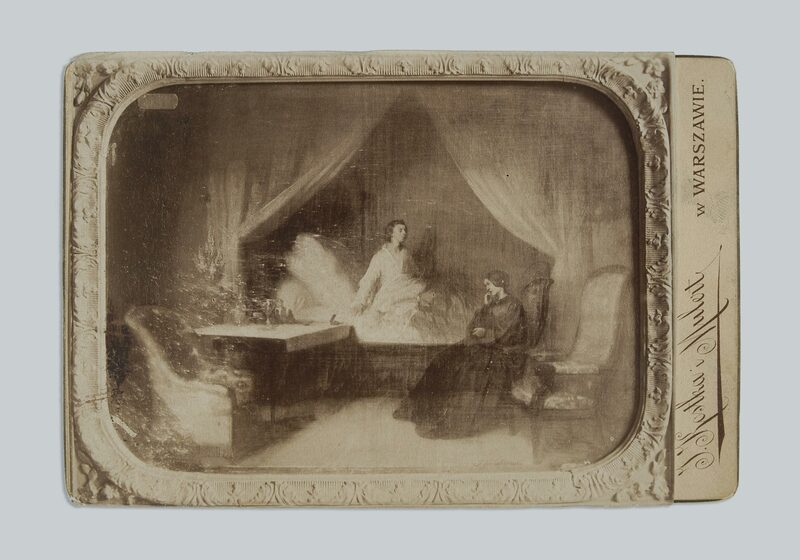 Clésinger was present during Chopin’s death in October 1849. Until the beginning of 1850 he created as many as 17 works dedicated to the artist. 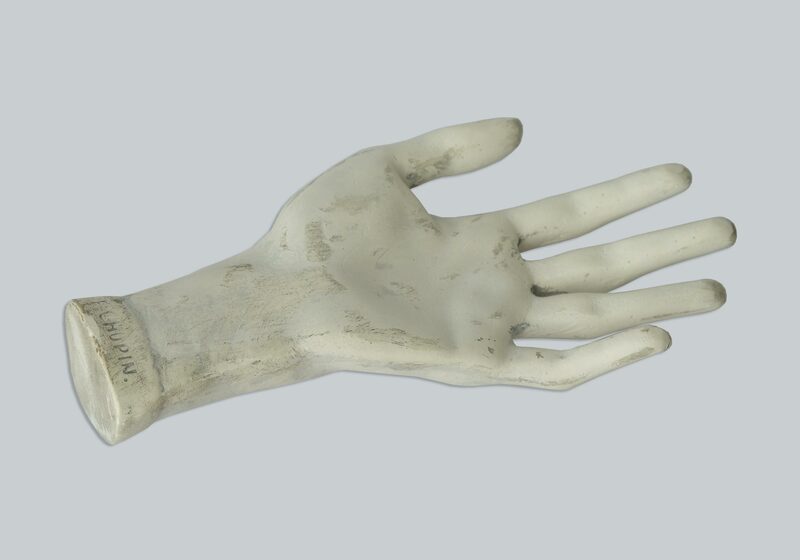 Marcelina Czartoryska, Chopin’s friend and student, ordered a bronze cast of the composer’s hand from Clésinger. 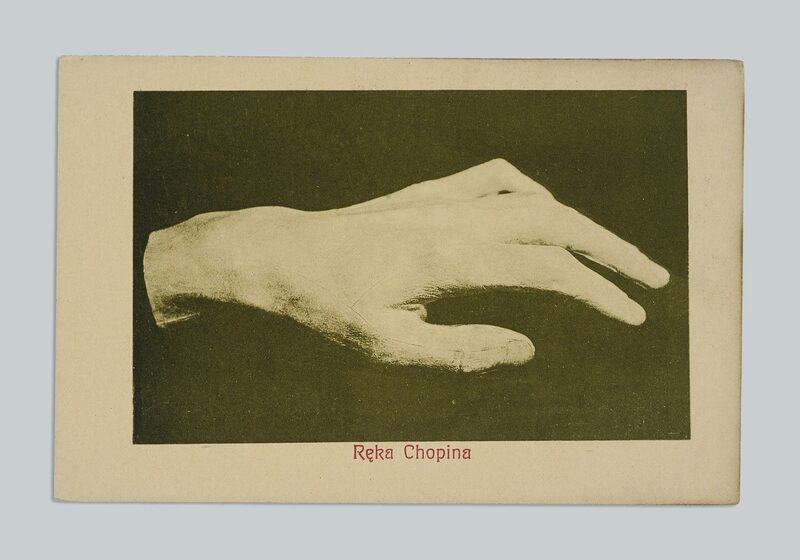 As we can see by this postcard, the hand of the virtuoso became a sought-after memorabilia. 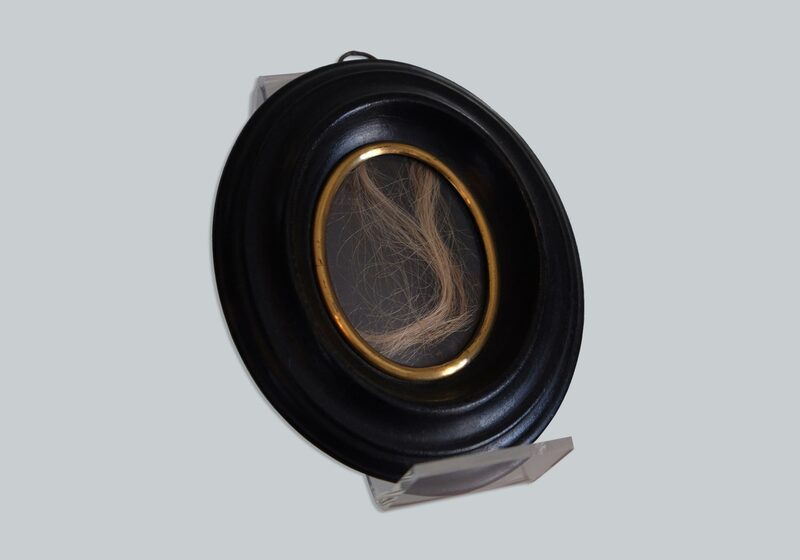 In the 19th century hair was a valuable memento, not only of the deceased. Among the possessions of George Sand that are currently displayed in the Museum of Romantics in Paris is a finely woven hair bracelet, a present for the novelist from a girlfriend. Death masks are also made today. 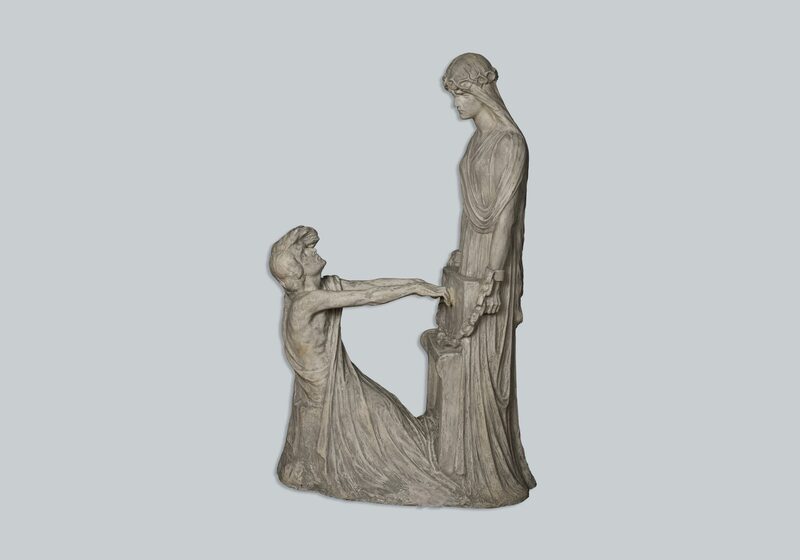 They are most often used as models for portrait sculptures. Death masks of politicians and serial killers are known, or even of Nikolai Tesla and Bruce Lee. The paintings and sculptures of Bolesław Biegas (1877-1954) can be seen today in the Musée Boleslas Biegas on Quai d’Orléans 6. He arrived in Paris in 1901, after he had been expelled from the Krakow School of Fine Arts. Biegas worked on a series of works dedicated to Polish poets – Mickiewicz, Słowacki, and musicians, Wagner and Chopin among them. 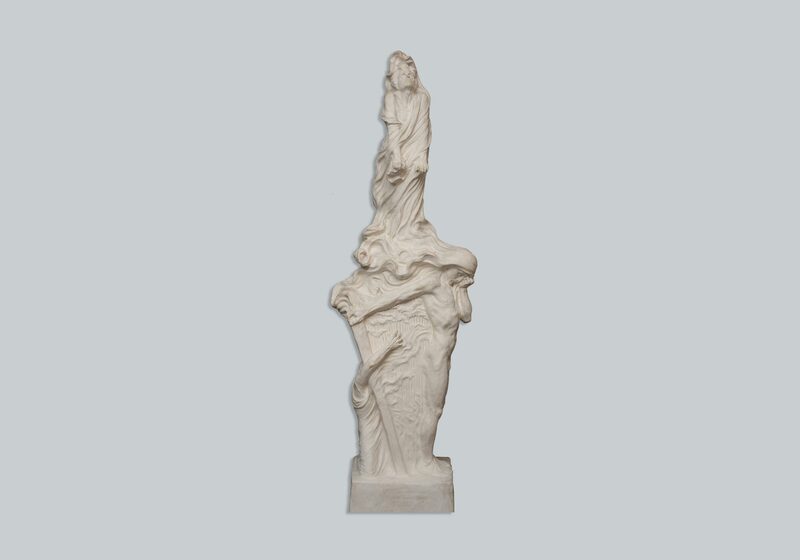 Chopin and his music keep reappearing both in the artist’s paintings as well as sculptures. August Clésinger is the author of the monument surmounting Frédéric Chopin’s grave. The project was confirmed by Eugene Delacroix and the headstone was placed on the Parisian graveyard Père-Lachaise on the first anniversary of the composer’s death.